Last night, guests gathered at Omar's for a party celebrating the NYFF premiere of "Clouds of Sils Maria," starring Kristen Stewart and Juliette Binoche with writer/director Olivier Assayas. Partygoers enjoyed a Lillet cocktail named Maria's Alpine Escape, and each other's company. Sundance Selects with Moncler, W Magazine, and The Cinema Society hosted the evening. 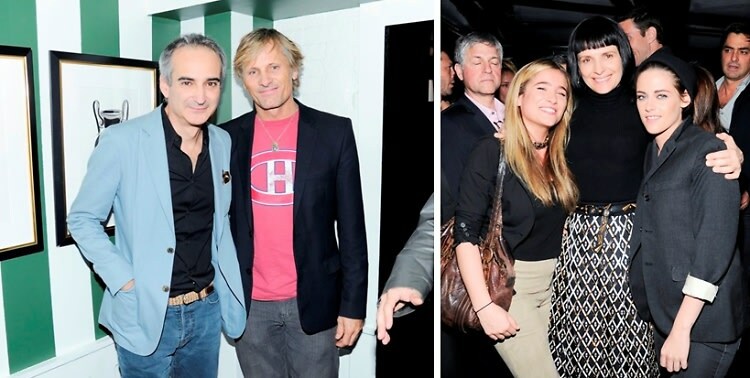 Who was there: Guests included Kristen Stewart, Juliette Binoche, Olivier Assayas, Patti Smith, Willem Dafoe, Viggo Mortensen, Sharon Stone, Noah Baumbach, Brian De Palma, Chloe Sevigny, Peter Facinelli, Nicholas Hoult, Dakota Fanning, Ebon Moss, Sebastian Stan, Melissa George, Margarita Levieva, Condola Rashad, Pablo Schreiber, Joseph Cross, Jake Paltrow, Brigitte Lacombe, Kim Gordon, Casey LaBow, John Krokidas, Antoine Verglas, Cory Bond, Daniel Benedict, Anh Duong, Will Cotton, and Andrew Saffir.